Located east of Beaujolais, just on the border between France and Switzerland sits Savoy, a small Alpine region that makes up for its relatively tiny size by having a very complex constellation of grapes and labeling conventions. I've been reading a few different sources, and I'm not sure that I can accurately represent the complexity of this wine region here. From what I can gather, there are four separate AOC designations and within those AOC designations, there are also cru designations. From what I can gather, the layout here is similar to Beaujolais, where there is the general AOC Beaujolais designation that covers a large area, but within Beaujolais, there are villages that are entitled to list the name of the village in addition to the Beaujolais designation. So a wine produced in the village of Morgon, for example, is allowed to put the name of the village on the bottle as well as the blanket designation of Beaujolais. For our purposes here, the bottle in question is from the cru village of Abymes in the Vin de Savoie AOC. Abymes and Apremont are the two villages in the Vin de Savoie that are responsible for the largest volume of production. They got their names in a pretty gruesome way. In November of 1248, there were torrential downpours in the region and a section of Mont Granier, estimated to be about 500 cubic meters of rubble, crashed down on the village of St. André and several other nearby villages, burying between 1,000 and 5,000 people (depending on the source). For centuries, this land was left untouched but was eventually planted over to vineyards. Apremont loosely translates as "bitter mountain" and Abymes as "ruin" or "abyss." 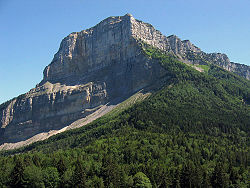 In the image to the right, you can see the sheer cliff face of Mont Granier which was left after the landslide. Wines from Savoy are allowed to use the name of the grape varietal on the label, which is a little unusual for French wine. The whites are typically made from Roussette (also known as Altesse), Roussane, Gringet, Pinot Gris and/or Jacquère . As a general rule, if the bottle doesn't indicate which varietal was used, it's probably Jacquère. Apremont and Abymes are both made exclusively from Jacquère, which is high yielding and grown almost exclusively in Savoy. There are about 1,000 hectares (2,500 acres) planted to Jacquère in the Savoy region. 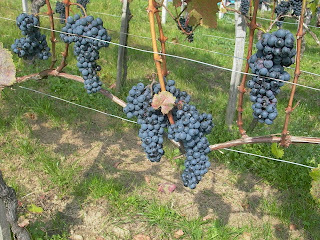 It can be difficult to find any Savoy wine in the United States since local production tends to be very small while local consumption is very high. It may be that as much as 80% of the production is consumed locally by thirsty alpine skiers and regional inhabitants, leaving very little for export. I was fortunate enough t o track down a bottle of Vin de Savoie Abymes at a local shop for around $14. It's difficult to tell who the producer of the bottle was due to the proliferation of names on the label. It was either Domaine Labbé à Les Marches or Gaec du Pont Royal Vignerons. In any case, the vintage was 2009 and a picture of the label is on the left there. The wine had a very pale straw color and a rich nose of pear and green apple with a clean minerally smell. On the palate, the wine was light bodied with high acidity that was kind of tingly and effervescent feeling, though there weren't any bubbles present. There were pear, green apple and bitter almond flavors along with a bit of herbaceousness. It was wonderfully light and refreshing with a crisp, clean minerality to it. This is very reminiscent of a good Muscadet, but it had a bit more complexity of fruit on the palate and it lacked the leesy yeastiness that Muscadet can have. The food pairings, I would think, would be pretty much the same as for Muscadet: raw shellfish or light shrimp/scallop dishes or just as an aperitif. This is a classic summer sipper that really helped me to forget the three feet of snow that is currently sitting out in my yard. The former Soviet republic of Georgia is no stranger to this blog. In the course of writing this blog, Georgia is definitely the nation I've gained the most new knowledge about, accounting for about 25% of my total posts so far. I've gone into some of the history of the region in previous posts and people curious about that aspect should consult the posts linked above or in the sidebar to the right. While Georgia's wine history goes back several thousand years, its sparkling wine industry is a fairly new phenomenon, going back about 130 years. Ivan Bagrationi-Mukraneli, born in 1812, was a member of the Georgian Royal Family who took up agriculture in 1881 (after a stint in the military) and focused on improving the farmlands around the royal estate. He recognized the lack of a serious sparkling wine industry in his home country that could compete with the Champagnes and other sparkling wines of Europe and set as his task the creation of an original sparkling wine made from native Georgian varietals. His initial efforts were made from Chinuri (also known as Chinebuli), Goruli Mtsvane (or just Mtsvane), Tsitska and Tsolikouri and were met with almost immediate success. In 1882, his sparkling wine won The National Emblem, the highest possible prize, at the Moscow International Exhibition. 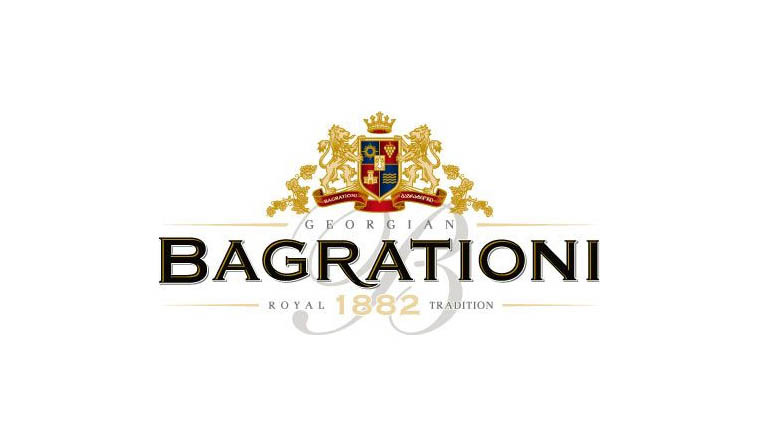 This achievement is reflected in the name of the current company, Bagrationi 1882. As with most things concerning Georgia, Russia has been a major factor in the success or failure of Georgian wines. In 1937, during the Soviet occupation, a company was set up in Georgia called Tbilisi Factory (ugh) of Champagne which was responsible for satisfying 15% of the Soviet demand for sparkling wines. In the 1980's, Georgian production peaked at around 24 million bottles under the brand name Soviet Champagne. The 2005 Soviet embargo on Georgian wines had a devastating effect on the local market since about two-thirds of the Georgian production was consigned to Russia, forcing the wineries to look abroad for other markets. Bagrationi 1882, thus far, has been the only Georgian sparkling wine maker to land on American shores (and they only landed here in 2009, I believe). They have a wide range of products one can peruse here. The bottle I picked up was the NV Brut which is made from Chinebuli, Tsitska and Mtsvane grapes and retails for about $15. In the glass the wine had a pale straw color with steady, vigorous bubbles. The nose was a bit reserved with some ripe apple and pear. It lacked the typical yeasty smells of bread and toast, which made me think that this probably wasn't made with the methode Champenois, and a little bit of research confirmed that suspicion. While some of the higher end bottlings from Bagrationi do use the traditional method, this bottling and most of their lower end bottlings use the Charmat method, also known as the metodo Italiano (so called because this is the method used to make Prosecco). In this process, the wine undergoes its secondary fermentation in stainless steel tanks rather than in the bottle which limits the wine's contact with the lees and thus prevents those secondary bready aromas. In the mouth, the wine was full bodied with high, crisp acidity. It was definitely dry with tight, steady bubble structure. There was a little bit of green apple flavor and maybe a touch of lemon-lime citrus, but overall, there wasn't much fruit here. There was a little bit of toastiness on the palate. To me, this was somewhere between a Prosecco and a Champagne. It's certainly not a substitute for Champagne, but it definitely has its place as an aperitif or as a nice palate cleanser for light hors d'oeuvres. Romania is a country, much like Georgia, with a long vinous history that has been obscured by recent political struggles. Like Georgia, Romania was occupied and controlled by the Soviets early in the cold war, but unlike Georgia, Romania was able to shake free of Soviet influence, to some extent, in the 1960's. The man responsible for Romanian dissent against the Soviets, unfortunately, was Nicolae Ceausescu. Early in his reign, Ceausescu was open towards the United States and other Western European nations, unlike many of the Soviet Bloc countries. Later on, though, Ceausescu created a cult of personality as his reign became more dictatorial and his relationships with other countries began to break down. Ceausescu brought the country to the brink of total financial ruin before being overthrown in 1989. As we've discussed with the nation of Georgia, a country's ability to have any presence in overseas markets generally owes a lot to it's recent geopolitical history. Being behind the Iron Curtain is not only deleterious to a country's wine making image because of trade restrictions, but communist governments typically are not focused on making quality wine so much as they are concerned with bulk wine production. Quantity is sought after rather than quality and the infrastructure within the country is set up to create ordinary bulk wine rather than fine wine. When international markets finally open up after the dissolution of Communist governments, there is no external market for this ordinary wine and the country, if it wishes to compete on the world marketplace, must begin to make significant investments in upgrading vineyards as well as winery equipment. Romania seems to be on the right track with these things, as they are currently 12th in world production. There is also currently an influx of outside investors eager to take advantage of the reasonable land costs within the country. 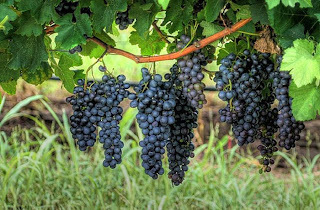 The Greeks brought the vine to Romania between 3,000 and 4,000 years ago (I've read some sources that say 3,000 years and some that go as high as 6,000). There is a legend that says that the Thracian god of wine was born in Romania in the Danube delta. Romania has a few viticultural areas, most of which are near the Moldovan border in Eastern Romania in what's known as Moldovan Romania. Perhaps the most famous Romanian wine producing region is Cotnari, which is located in eastern Romania very near the Moldovan border. 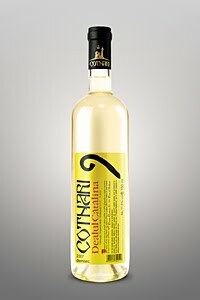 Cotnari, at one time, was world-renowned for a sweet dessert wine somewhat like Tokaji in Hungary. Wine from this region was the favorite of Stephen the Great who ruled Moldavia in the late 15th century. The wine in question today hails from Cotnari. Many Romanian vineyards were replanted with the common European vinifera vines after the devastating phylloxera outbreak in the 1880's but there are still a number of native Romanian/Moldovan grapes being grown throughout the country. Fetească Albă is the most widely grown and perhaps best known. The wine I tasted contained Fetească Albă as well as Frâncuşă and Tămâiosă, which, as far as I can tell, is just another name for Muscat. The wine was non-vintage and cost about $12. In the glass, it was very pale and silvery. At first, the nose was very reserved with only some ripe pear aromas present. As the wine came to temperature and opened up a bit, there was much more peachy stone fruit aromas. On the palate the wine was off-dry with a medium body with medium acid. There were flavors of candied pear, green apple, candied orange peel, white peach and apricot. This is somewhere between a restrained muscat and a kabinett level riesling. There was kind of an odd chemical taste on the back end, but overall, this was pretty enjoyable. The wine was balanced so that the sugar wasn't overwhelming and this tasted more like a wine to serve with spicy food rather than a dessert wine. This website is certainly no stranger to Rkatsiteli. Over the past few months, I've gone on an extensive tasting spree, but most of my efforts have been with bottlings from Rkatsiteli's native homeland of Georgia. The reason for this has mostly been that the producers of Rkatsiteli in the United States don't produce a lot of bottles and their distribution doesn't reach extensively into my area. Over the Christmas break, though, I had to good fortune of obtaining two more bottles of U.S. Rkatsiteli from various places in the Northeastern United States. 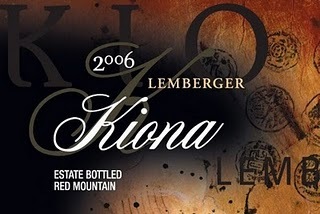 One of the bottles I had been looking for for awhile is made by Dr. Konstantin Frank's Vinifera Wine Cellars. I had a taste of this at a Boston Wine Expo a few years back, but hadn't had much luck tracking a bottle of it down in the Boston area. I was in Pittsburgh over the Christmas holiday and happened to run across a bottle in one of the state stores for about $20, so I snatched it up. The Konstantin Frank winery is one of the oldest in the Finger Lakes region, dating back to 1962. Dr. Konstantin Frank was the first person to plant and grow Vinifera grapes successfully in the Northeastern United States. His insight that it was the root stocks used in the vineyards and not the climate itself that was the problem with successfully growing Vinifera grapes revolutionized viticulture in the Northeast and in the Finger Lakes region of New York in particular. 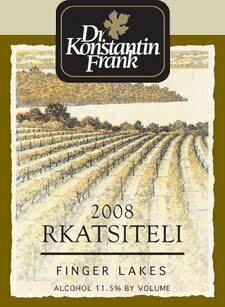 The winery puts out a wide variety of wines, the vast majority of which are very good, but the Rkatsiteli is the only one I'm concerned with here. The wine was pale and silvery in the glass with a clean, minerally nose with just a touch of lemon peel. It was medium-bodied with very high acidity. Lemon/lime flavors were the dominant fruit flavors, but the wine was really characterized by a wonderful clean minerality. I have in my notes that it "tastes like a clean rocky stream with lemon wedges floating in it." It's a great apertif wine that shares some similarities with the Westport offering, but lacks some of the complexity and heft on the palate. The other wine under consideration here is from Tomasello Winery in Hammonton, New Jersey, about half an hour outside of Philadelphia. Tomasello has started to branch out into the New England area a bit, but it mostly seems to be their sweet fruit wines that are showing up on our shelves here. If you're ever down in Atlantic City, I've seen a few of their offerings for sale in a wine shop in the Tropicana. My sister in law made the trip for me and picked up a bottle of their sparkling Rkatsiteli for $15. I've read in a few places that Rkatsiteli isn't used a lot in sparkling wine production because of it's tendency to have a high alcohol content when vinified. In fact, the one sparkling wine I've had from Georgia (the subject of a future post) contained three grape varietals, none of which was Rkatsiteli. Whether they do it in the Old World or not, Tomasello has created a sparkling wine made from 100% Rkatsiteli grapes. In the glass it was a pale straw color with small, steady beads. It smelled like sourdo ugh bread mixed with citrus peel and ripe apples. It had a high acidity and creamy mouthfeel with kind of a loose bubble structure. There was a touch of sweetness to it, which made me wonder whether it was an aesthetic decision to leave this a little off-dry or whether it was born of necessity in trying to keep the potentially high alcohol in check by not fermenting all of the sugars to dryness. This wine also had some of the mandarin orange characteristics that I picked up in the Tbilisuri I sampled last month. This wine had considerably more acid structure than that one did, which really helped to hold it together. All in all, it was a nice sparkler, but it isn't likely to take the place of Champagne in my cellar any time soon. 1) It's a very versatile grape. I hope that the wide variety of styles that I have been showcasing here is a good testament to the many different ways it can be vinified. It reminds me very much of Riesling in that it's good dry, off-dry and even sparkling. I didn't have a dessert wine made from Rkatsiteli, but it wouldn't surprise me if there was one. 2) It can be a very tasty grape. The New World examples, especially from Westport and Konstantin Frank really show the heights that this wine can ascend to. I didn't dislike the Old World examples, but I'm definitely not as accustomed to those styles as I am the Newer versions. 3) It's a pretty hardy grape. It seems to do pretty well in a variety of climactic conditions, from the ideal growing seasons in its native Georgia to the harsher New England climates of Massachusetts and upstate New York. So I hope you'll go out and give Rkatsiteli a shot. It's one of the oldest varietals around, and it still has the capacity to surprise and satisfy you. Ok, everybody buckle up for this one. The topic today is Argentinian Bonarda, and it's a tough grape to really pin down. For starters, there are several different Bonardas: there's Bonarda Piemontese, grown in Italy's Piedmont region and which has the synonyms Bonarda dell'Astigiano, Bonarda di Chieri, Bonarda di Gattinara or Bonarda del Monferrato; there's Bonarda dell'Oltrepò Pavese, grown in the Lombardy region of Italy and also known as Croatina; and finally there's Bonarda Novarese, grown around Piedmont and Lombady and also known as as Uva Rara. 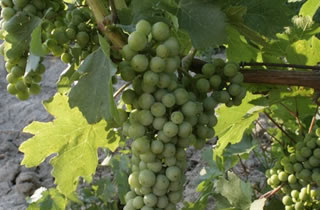 According to Argentinawineguide.com, the Bonarda grown in Argentina is either Bonarda Piemontese or Bonarda Novarese. Jancis Robinson (In the Oxford Companion to Wine), Oz Clarke (in his Grapes and Wines) and Wikipedia disagree and believe that Argentinian Bonarda is actually Charbono. But which Charbono? There is a Charbono grown in California, that it turns out is actually a French grape also known as Corbeau in Savoie. Some sources (Oz Clarke is on the fence, but Jonathan Alsop in his Wine Lover's Devotional) also believe this Charbono is the same as Dolcetto, grown in the Piedmont, but genetic testing says that this isn't the case. There is also an Italian Charbono grown in Barbera and Dolcetto vineyards in Piedmont which is not related to Corbeau or Dolcetto at all, which Jancis Robinson believes is the true Bonarda. So which is it? The answer is, we still don't know. The strongest case seems to be for the Italian Charbono (UPDATE: As noted in the comments below, the French Charbono, or Corbeau, actually seems to be the closest match and Argentina is allowing winemakers to label their Bonarda as Corbeau if they wish. Thanks to commenter Gavilan Vineyards for the information). There is a large number of descendants of Italian immigrants in the country, with an estimated 60% of the population having some degree of Italian descent. Many of the Italian immigrants came from the Piedmont and Lombardy regions, where the Italian Charbono hails from. In any case, more research will need to be done to figure out what Bonarda actually is. When most people think about Argentine wine, Malbec is what immediately springs to mind. Malbec is by far the most planted red grape in Argentina with over 20,000 hectares devoted to it in 2003. Before Malbec became the big star, Bonarda was the most planted red grape in Argentina and it is currently the 2nd most planted red grape there with about 16,000 hectares planted (Cabernet Sauvignon is a very close third and likely to overtake Bonarda soon with 15,440 acres planted). It is not as omnipresent in the US marketplace as Malbec, but it is easily obtainable from larger wine shops. The bottle I picked up was the 2006 Trapiche Broquel Bonarda from Mendoza, Argentina. I paid about $18 for it. The wine was inky purple/black in the glass with incredibly deep saturation. It was completely opaque with even a small tasting pour in the glass. The nose is rich and complex with aromas of bittersweet chocolate, blueberry jam, intense black cherry aromas, boysenberries, blackcurrants/creme de cassis, and espresso. The perfume on this was rich, heavy and dense and I could have probably smelled it for about half an hour without getting tired of it. 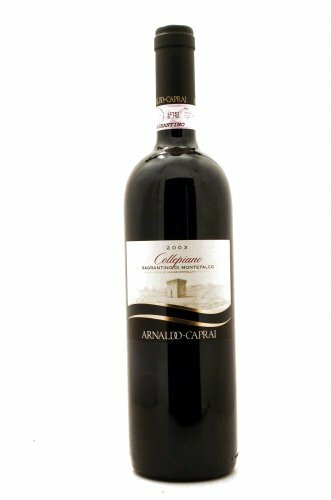 On the palate, the wine is full bodied and intensely rich with flavors of chocolate, charcoal, cola, blackcurrant and blackberries. This is a wine that Robert Parker would probably use the phrase "gobs of fruit" for. The fruit flavors are rich and sappy, so extracted that it's almost sweet, but there are those nice earthy elements there also that keep this from tasting like syrup. There is a nice acid base and fine, powdery tannins. This is a blockbuster of a wine for the price and would be ideal with grilled meats, steaks, roasts or just sitting in front of a fire and relaxing. If you're a fan of rich, extracted new-world red wines, this is just the things you are looking for. Whatever grape is actually in this bottle is pretty tasty. Many readers may be surprised to learn that Spain actually is the world leader in vineyard acreage (as of 2008), leading second place France by almost 750,000 acres. Surprisingly, Spain is a very distant third as far as volume of wine produced, trailing world leader Italy by almost 15 million hectoliters. Why the discrepancy? Well, Spain is very hot and very dry (excepting the northwest Galician corner, which will be the subject of a separate post). Because of these conditions, vines are planted much farther apart in many regions of Spain than in the rest of the world. Vines need the extra space so they won't be competing with one another for the meager water supplies. The extra spacing also allows air to circulate, keeping the vines from overheating. The result is that Spain has a lot of land dedicated to vineyards, but that land is more sparsely planted, resulting in lower yields and lower overall production numbers. Right in the middle of Spain is a region called La Mancha, perhaps best known for being the home of Don Quixote. La Mancha is a large plateau with an elevation of about 2000 ft., which also helps keep the temperatures more manageable, though it is still very hot and dry in the summer. Aside from being home to Don Quixote, La Mancha is the world's largest continuous vine-growing region in the world. They have 190,000 hectares of land devoted to viticulture, which would be enough to put the region 22nd in world production were it a separate country. La Mancha produces more wine than the entire continent of Australia. Most of the production was from the Airen grape which, as a result of the expansive planting in Spain, was (and possibly still is) the world's most planted white grape variety. For many years, this region was the wine lake of Spain, producing a great deal of bulk and low-quality wine (think of the Central Valley in California or the Languedoc in France). 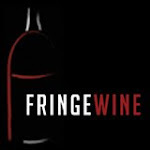 In recent years, though, a few quality oriented producers have stepped up and are making a commitment to produce fine wine in this region (again, similar to what has been happening in the Languedoc recently). One of those producers is Paso a Paso. In addition to the Verdejo that I tried, they also produce a bottling of Spain's most famous red grape, Tempranillo which, while I have tasted and can recommend it, I will not be going into any detail about here. 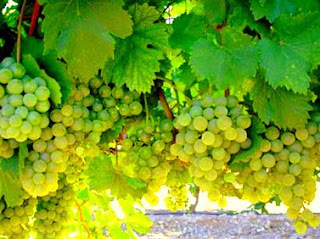 Verdejo is perhaps most well-known, if it can be considered well-known at all, in Rueda, a small region north of La Mancha and the city of Madrid and just west of the Ribera del Duero. It's actually pretty difficult to find a description of Verdejo that doesn't immediately mention Rueda. 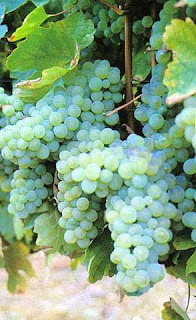 Verdejo is native to Rueda and is not planted very extensively in other regions. Jancis Robinson, in her Vines, Grapes and Wines has this to say about Verdejo: "Of all the white varieties among Spain's official top twenty, Verdejo is probably the one with the most discernibly aristocratic character." As a casual Marxist, that kind of description makes me grit my teeth a bit, but I dove in to see what Verdejo is all about. I picked my bottle up at the aforementioned Gypsy Kitchen in Quincy, MA for $14. My bottle was the 2009 vintage (I wouldn't swear to it, but I'd guess that vintage to vintage variation is pretty small here). In the glass it had a pale straw color and was brilliantly limpid and clear. The nose was exuberant with strong aromas of ripe pears, peachy stone fruit, grapefruit, ripe apples and flowers. The wine is dry and full-bodied on the palate with a rich mouth-feel and medium acid. Apricots and grapefruit peel were the dominant flavors, with some creamy pear. There was a nice minerality to the clean, crisp finish. I would say this wine tastes like a mix of viognier and riesling with the stone fruit and flowers of the former mixed with the citrus and acid of the latter. It's an outstanding wine for $14 that I was happy to drink on its own, but which also has a wide variety of possible food combinations (roasted chicken or Thanksgiving turkey spring immediately to mind as excellent matches). Aristocratic wasn't the first thing that sprang to my mind when considering this wine, but it was warm, friendly and attractive, three characteristics I'd much rather have in a companion than aristocracy. 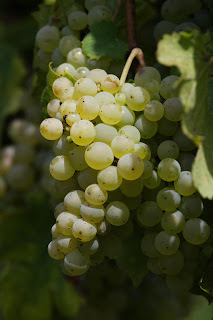 Please see this more recent post for a tasting note of a Verdejo wine from the Rueda region of Spain.